This was one of those crazy weeks of disruption, extra work, but good results in the end. 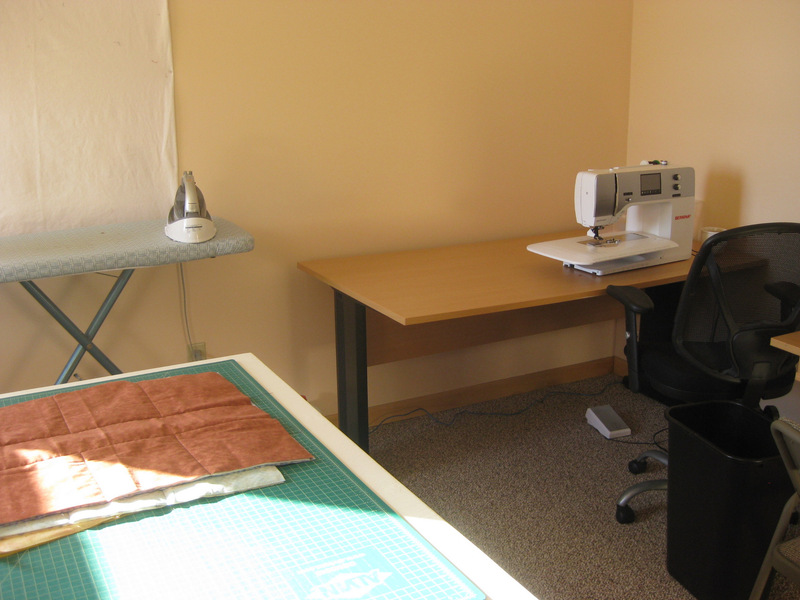 The day finally arrived when my sew ing studio was getting new carpet and new wall paint. Dismantling everything in the room and completely emptying it was a daunting task. But…the painting was finished last weekend and the new carpet arrived so this weekend I’m reorganizing! I took this time to also clean out many of the boxes and bins of fabric, moving some supplies into a closet in a different room and opening up my sewing studio closet so it is an extension to the room. I had an old hutch from my parents’ house and with the doors removed, my bins of scraps fit in perfectly. 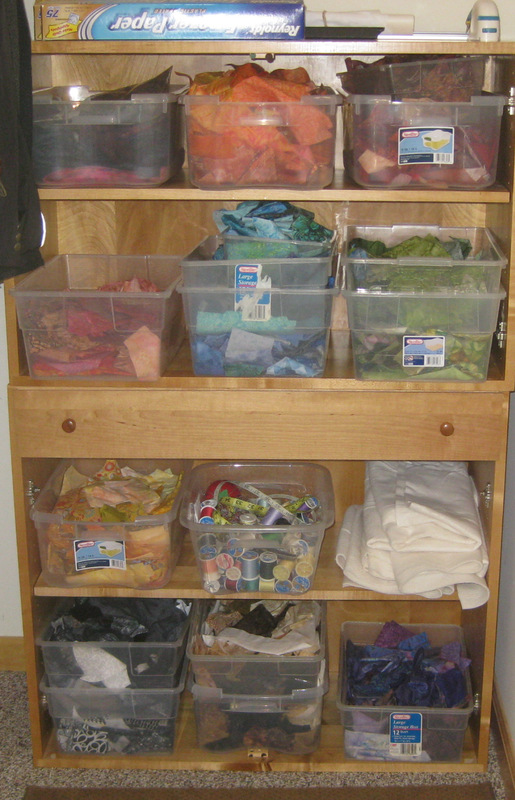 This hutch fit into the end of the walk in closet so these scraps are sort of tucked away but easily accessible. All my furniture is recycled and repurposed. Even my cutting table is a top we made that sits on a small bookcase and on my mom’s old cutting table. I am so happy with the end result!! 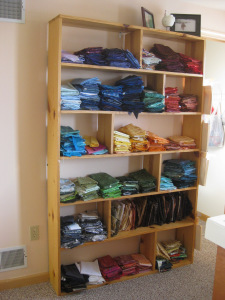 I haven’t put up any quilts on the walls yet and may not….I’m still thinking about using wall space for design with a few more flannel wall sections. Also, as I do more free motion quilting I find I need some sampler wall quilts with ideas on free motion designs I like. This weekend’s goal is to make a few small wall hangings with samples of those stitches. The change from a room painted Dill Pickle (one of Benjamin Moore’s colors) with dark green carpet to a room with pale peach walls and a neutral tone carpet has been unbelievable! I was feeling a bit of color overload in the old room. Now my quilt projects and fabric supply will provide the perfect balance between color and some space where my mind can think more clearly. By Monday I should be back working on new projects.